I've received a few e-mails from folks asking for a demonstration on sharpening in LAB mode. With this technique, we are going to be targetting just the Lightness Channel - affecting only the lightness values in the image. In today's image, detail is important. In a structural failure such as this, I want to highlight the sources of that failure. 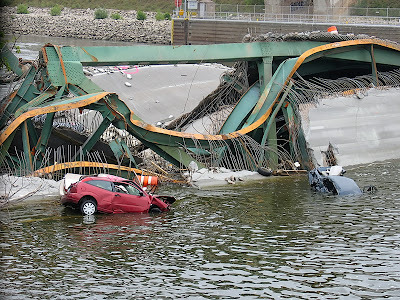 In this case, the bridge's details, the torn and twisted metal, the bent rebar, and the broken concrete all have a part to play in the telling of this story. I also want to make sure that the items in the water receive attention. To begin, work the image as normal (focus correction, global light/colour, local light/colour) until you come to the Creative Sharpening stage. If you've performed the previous corrections in RGB, save the layered file before moving into LAB mode (Image>Mode>Lab Color). If you moved to LAB mode before making the initial corrections, continue on. Press Ctrll+Alt+1 to select only the lightness values. Invert the selection - Shift+Ctrl+I. Click Ctrl+H to hide the selection. With the Channels Palette open, select the Lightness Chanel. Selecting the Unsharp Mask filter (Filter>Sharpen>Unsharp Mask) brings up this dialog. For today's image, I've used Amount=150, Radius=3, and Threshold=2. You can toggle the Preview button on/off to preview the results. When you've finished applying the filter, click Ctrl+D to deselect the lightness values (remember, you hid them earlier). Continue on with the workflow (saving as necessary). When you are finished, you'll see that the difference can be quite dramatic. Try this one for yourself. You'll be glad you've added LAB sharpening to your tool box. Can you zoom in on that license plate? 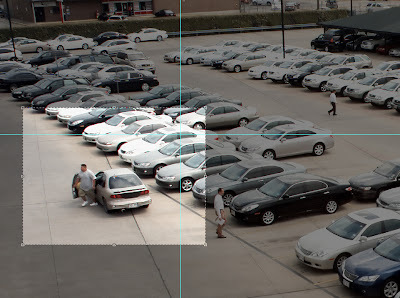 This Monitoring image comes from an Avigilon system's 16 megapixel camera. Monitoring: to watch the flow of traffic or the movement of people where you do not need to pick out individual figures. Detecting: to detect the presence of a person in the image, without needing to see their face. Recognising: to recognise somebody you know, or determine that somebody is not known to you. Take a look at the picture above. Can you make out faces or license plates? No. So, if your purpose is to identify these items, that picture view just won't do. With Photoshop, we can zoom in. Let's see what happens. 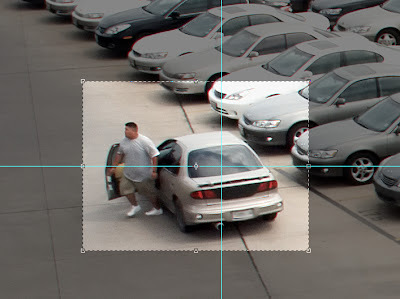 This Detecting view comes from zooming in a 16 megapixel image. We can now see the people and vehicles more clearly. We can gain a general awareness of types of vehicles. We are closer to identifying them, but we don't have anything yet that will help us to prove identity beyond a reasonable doubt. We can zoom in further to see if we can Recognise anyone. This Recognising view comes from zooming in a 16 megapixel image. 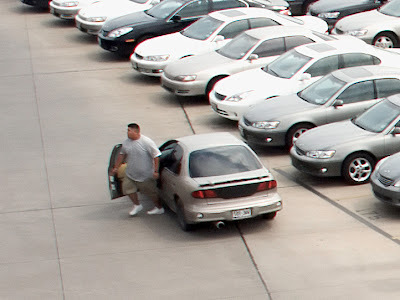 At this level of magnification, someone who knows this person or car should be able to say, "that's him" or "that's not the man/car you are looking for." At this point, we can begin to accurately describe the individual in the scene. 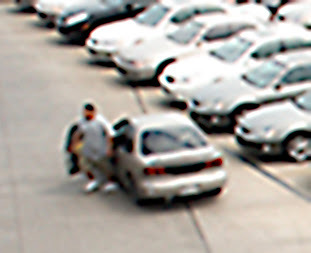 Let's zoom in some more to see if we can positively identify this man and the car. 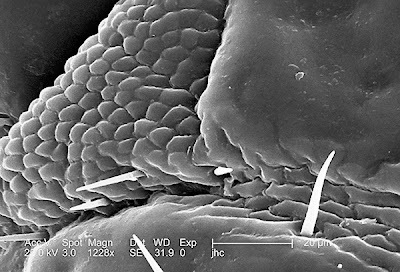 This Identifying view comes from zooming in a 16 megapixel image. 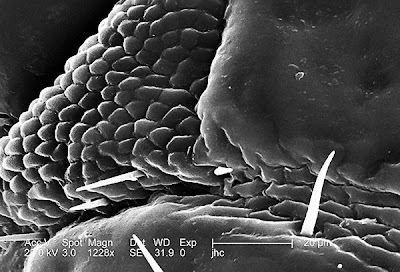 With a 16 megapixel image, we can even zoom in closer than this image. But notice what's happened along the way. We've sacrificed field of view for detail. 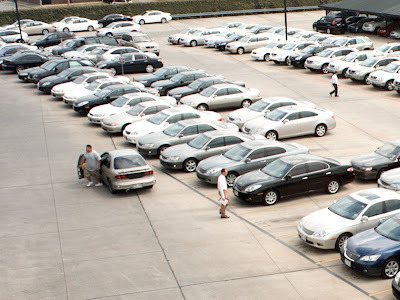 No longer are we looking at the whole parking lot (monitoring). We can't see the other people who are walking around (detecting). 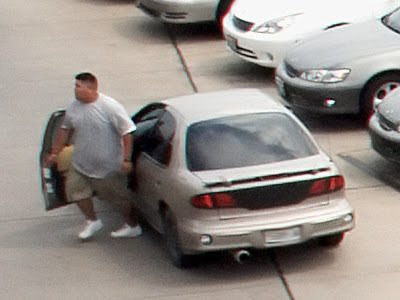 In order to identify this individual, we've had to zoom in so far that we've excluded much of this scene from our view. A CCTV Installer might position a camera/lens combination at a choke point specifically to get facial recognition whilst installing other cameras around the area to monitor and detect movement of unauthorised persons. But what about real life. 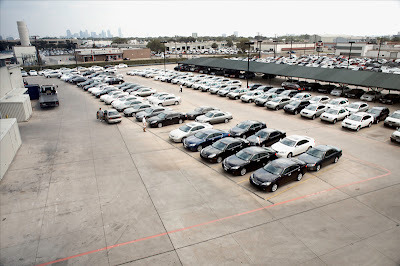 The good folks at Avigilon have a small piece of a very large market. What if that same monitoring image was only 4CIF or 2CIF. Could we still zoom in and identify the individuals in the scene? You be the judge. 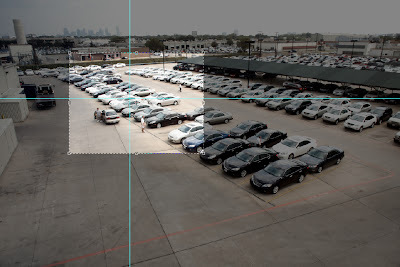 The image from Avigilon contains 15,824,256 pixels and can come in a lossless RAW format. This image contains only 426,400 pixels and is compressed. With an almost 97% reduction in the amount of available pixels and the additional compression, the results speak for themselves. The result of zooming in on a low pixel count image. So, the answer to "can you zoom in on that license plate" is ... it depends on the quality of the image and the number of available pixels. This morning's tip is a fun one: using the Sponge Tool to control local contrast. For this, we'll turn our attention to the image above. 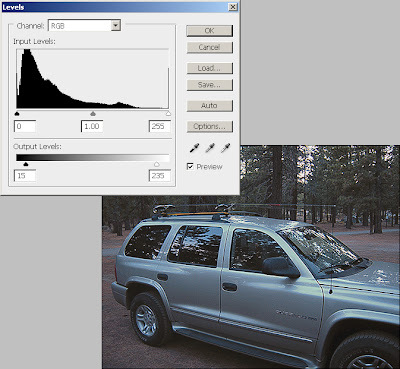 In Grayscale mode, the Sponge Tool increases and decreases contrast by moving the levels away from or towards midgray - depending on the blending mode that is chosen in the options bar. Don't worry, the Sponge Tool only supports Saturate and Desaturate. Try it for yourself. Saturate increases contrast whilst Desaturate decreases it. Applied on a separate layer, you can fade the effect with the opacity slider to get your image looking just right. 'By Oppression's woes and pains! 'Lay the proud usurpers low! The Ploughman Poet was born on the 25th of January 1759 in Alloway, South Ayrshire, Scotland. He's probably most famous for the poem/song Auld Lang Syne (Scots for "long, long ago" or "days gone by") and has been an inspirational figure to Scots and their descendants ever since. Join with me in hoisting a wee dram tonight to Rabbie Burns and Auld Lang Syne. and proud Scot (Clan MacFarlane). the hammer, and the caber. How many times do you receive memos or alerts that feature a photo as a prominent part of the message? Be on the look out for so and so. This car has been seen in the vicinity of ... Sometimes these alerts are printed on the office ink jet printer, sometimes they are printed on a laser printer, and they can be faxed as well. What: we want to fine-tune our images to match our output device. We want to produce the best quality images that we can with the printers that we have around the office. In our image, the shadow detail will be lost when printing on my laser printer unless I do something to protect it. I can also protect what little highlights there are. In the Output Levels portion of the Levels dialog box, I can change the shadow value from 0 to an appropriate number - in this case 15. I can change the highlight value as well - from 255 to 235. I am forcing a reduction in range - and forcing the image into a range that my printer can handle. This technique can also be valuable when preparing images for use in PowerPoint. Depending on the projector's capabilities, as well as the lighting in the room, you may need to fine tune your images in order to display them correctly. Why: We focus on bringing out details in images that will be an important part of identifying individuals or objects. These details can get lost when printing to lower quality output devices or when using a fax or photocopy machine. Adjusting the Output Levels of the image allows us to correctly display or distribute these images within our enterprise. A question came up today, "where can I find information about a specific player for this DVR recording?" Good question. Here's a good answer. By now, the DVR flip book (aka Best Practices for the Retrieval of Video Evidence from Digital CCTV Systems) has been distributed to over 20 countries. I am proud to have been a small part of its creation. I have also had the pleasure of both hosting and co-hosting training on Video Evidence Retrieval through NaTIA. When speaking on the topic of digital CCTV evidence, I always mention this great source of information, Larry A. Compton Studios. Larry's site is the go-to place for information on proprietary file types. I've been happy to help add to his list. But wait, there's more ... included on his site are links to helpful free programs ... like GSpot, a codec information appliance. File types with extensions like .60d and .dmi won't play in Windows Media Player. They need to be matched with their players in order to work. If you've received a disc with a bunch of proprietary digital video files on it and no information about where it came from, check out Larry's site. I received an e-mail recently asking for clarification on an issue regarding Adobe Camera Raw's interface. It seems that there is a bit of confusion on the difference between the Done and the Save Images buttons. Moving from left to right across the interface, you come first to the Save Images button. This button saves the current settings of a single or multiple selected files and opens the Save Options dialog box. Within the Save Options dialog, you can save a copy of the file as a Tiff, JPEG, PSD, or DNG file formats. If you Alt+Click the button, you skip the dialog box and use whatever settings were left over from the last time it was used. The Done button closes the Camera Raw dialog box and stores the current adjustments in the Camera Raw Database file or in a sidecar XMP file (depending on how your preferences are set up). You can use the Save Images option when making all of your corrections in ACR and you want to save those corrections in a separate file. Use the Done button to make your edits without creating a second file. For the most part, I think that folks are using ACR and selecting the Open Image/Open Object button to continue on in Photoshop. Thanks for the e-mails. If I see one that can benefit everyone, it'll end up as a post (unless you ask for it not to be). Here is a link to the Society for Photographic Education's job board. Need to find the right plug-in? Check out this list from the Adobe web site. Update: the review copy of my latest book, Forensic Photoshop - a comprehensive imaging workflow for forensic professionals, is on its way. Good news. If all goes well, it should be available for sale around Valentine's Day. Thanks to all for your support and patience. If you are a fan of High Pass sharpening like me, you've probably passed the Custom filter on a daily basis. You may have even opened it up to see what it does. Then, after seeing this spreadsheet looking thing, clicked cancel and haven't given it a thought since. Let's take a look at a couple of effects that can be produced using custom filters. Sharpening with the Custom filter. Note: the scale is 1 which is the sum of the weights. When you first open the filter (Filter>Other>Custom) you'll see a dialog box that looks like the one shown above. The dialog box has a table of boxes that allow you to input values called Weights. It also have boxes for Scale and Offset values. The values must be integers, no fractions are allowed. The scale should usually be equal to the sum of all the weights. If the sum of the weights divided by the scale is 1, then the offset should be 0. If the sum of the weights is 0 then the offset should be 128. If the sum of the weights divided by the scale is −1 then the offset should be 255. The image will be inverted from what it would be if the sum were +1. The sum of the weights divided by the scale should generally not be more than +1 or less than −1. Otherwise the image will come out very dark or very bright. The scale can't be less than 1 (you can't divide by zero). If the filtered image is very dark, the scale is probably too high. If it's very light, the scale is probably too low. The math behind custom filters gets a little complicated. Check out Ian-Albert.com for a perfect explanation of the underlying math as well as tips on creating an emboss filter or inverting an image. Gaussian Blur with the Custom filter. Note: the scale is 35 which is the sum of the weights. The site is a functional mix of text and pictures that highlight Sgt. Pearsall's outstanding work and not only tell her story, but the story behind her pictures. If you are looking to jazz up your presentations, why not check out what Adobe's Flash can do for you. I was doing some research to answer a reader's question and stumbled across this website, the Graphics and Media Lab of Moscow State University. And this interesting page, Converting Video to High Resolution Photo. I did end up finding what I was looking for, plug-in filters for VirtualDub, specifically, a de-interlacing filter. Turns out, the one that I was looking for is only available by commercial license (not free). With the economy constantly in the news, combined with a weakening US dollar, I am not surprised that many law enforcement agencies are looking to freeware to help with their case work. VirtualDub seems to be a popular choice for working with digital video. If you are evaluating noise reduction tools, here is a good site to check out. Michael Almond Photography has well thought out article on comparing noise reduction tools. It's a little outdated, but gives you a good sense of what's out there and what they can do. In spite of the age of the article, it serves as a good example of how to evaluate one piece of software vs. another. This one has to be the craziest example of a source of a colour cast yet. 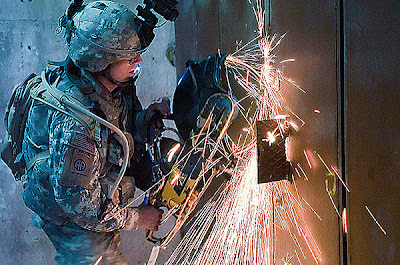 A combat engineer with Company A, 325th Special Troops Battalion, 2nd Brigade Combat Team, 82nd Airborne Division, uses a power saw to cut away storefront locks during an early morning raid on suspected sniper positions in Baghdad's Adhamiyah district. 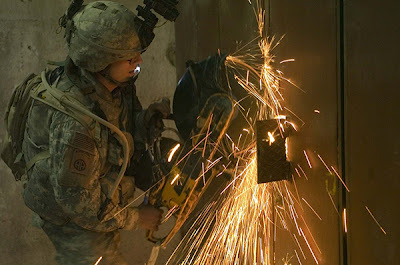 The sparks generated from the saw create an interesting cast, which combines with the indirect light from the sunrise. This one works as a good example of how colour cast removal, combined with a touch of focus correction, can reveal a great amount of detail. Notice the Corporal's arm on the picture above. Can you see the flag? Notice below. There are more examples, like the Airborne patch. What about elsewhere? The diamond plate hatch? Can you find more of them? I realise that budgets are tight and people might not be upgrading. My order for a Salient Stills VideoFocus Pro keeps getting kicked from year to year to next year. I completely understand. So with this in mind, here is a content sharpening tutorial that should work in versions of Photoshop back to 7 (maybe even 5.5). You can use this in the creative sharpening step in the forensic photoshop workflow and achieve some surprising results. 1. Create a duplicate of the image by dragging the layer over the Create New Layer button, or by selecting the layer and pressing Ctrl+J. 2. Click Image>Adjustments>Desaturate. The copied layer is converted into shades of gray. 3. Create a copy of the desaturated layer and select it. 4. Click Image>Adjustments>Invert. 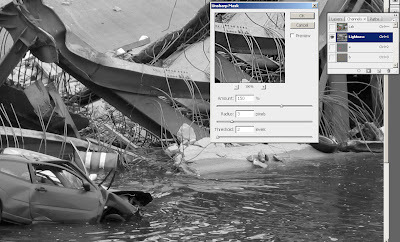 The image layer becomes a grayscale negative (leave the negative image selected). 5. Click the Blending Mode list arrow on the Layers palette, and then click Color Dodge. The image appears to change to white. 6. Click Filter>Blur>Gaussian Blur. Very slightly blur the image (just a few radius pixels) until you see a soft-ghosted outline of the image. 8. Select the top layer in the Layers palette, click the Layers Options button, and then click Merge Down, or press Ctrl+E. You should now be left with the original image (the bottom layer), and the softly ghosted image (the top layer). 9. Click the Blending Mode list arrow on the Layers palette, and then click Multiply. The white areas of the ghosted image change to transparent and the darker lines are blended in with the original image, creating the illusion of sharpness. 10. If your image appears too sharp, move the Opacity Slider away from 100% until you've reached the desired result. There you have it. 10 simple steps to a new image. A new white paper has been added to Adobe's digital photography white papers and primers section of their web site. Non-Destructive Imaging: An Evolution of Rendering Technology by by Peter Krogh is a must read. "SO WHAT IS DESTRUCTIVE IMAGING? 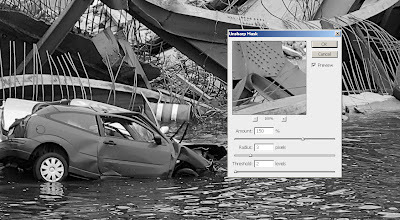 You might be tempted to ask, why destroy your photos? Aren’t you supposed to make them better? The word destructive is not referring to destruction of the photo’s goodness, but rather destruction of the original data in the image.So while you may make a photo “better” by lightening up shadow detail, you may do it in a way that destroys the original information. This paper concentrates on ways to adjust photos without losing the original information." Ultra slow motion movies ... from a point and shoot camera? Check this bad boy out. Casio's EXILIM Pro EX-F1 may be the fastest point and shoot camera in the world. This sounds crazy. But it's on the show floor at the CES. Check out Gizmodo's review of this interesting new toy. It's set to drop into stores this spring at a price just under US$1000. They've even put the camera to the test. Check out this still from a burst series. Not bad. It's a bit dark, so I cleaned it up a bit. I love the CES show. If you are like me, you process hundreds of images per day (sometimes thousands). Photoshop can get bogged down with all of its cache info; undos, clipboard info, and histories. A little known command burried near the bottom of the Edit menu is Purge (Edit>Purge). With Purge, you can get rid of your undos, clipboard, histories ... or all of the above, in an effort to speed up your machine. Just remember, if you use this one, it really does remove these items. After you press that button, there's no going back. 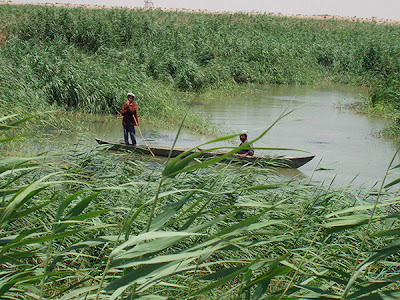 One of the least talked about successes in the war in Iraq is the restoration of the Mesopotamian Marshes. Here two men pole a mashoof, a traditional wooden boat, through the Al-Hawijeh marsh. The people of the marshes are the Ma'dan (Marsh Arabs). The Ma'dan of Southern Iraq live a lifestyle dating back 5,000 years. The US Army Corps of Engineers played an important role in advising the Iraqi Ministry of Water Resources, (MOWR) as they work to restore the Marshes destroyed by Saddam Hussein after Desert Storm. If you are looking to start a career as a photographer, the USACE is a great place to start. They are announcing an entry level position of Public Affairs Photojournalist (GS-5) at Ft. Eustis, Va. The vacancy announcement number is SCER07395784D and the closing date for applications is Jan 09, 2008. The above picture with the colour cast removed and a touch of sharpening. From time to time, you may be called upon to scan something that was printed in a newspaper. It may be an article for your boss or a picture for use in PowerPoint. Newsprint offers a unique set of challenges. The web fed 4 colour process that is employed in newsprint softens images and flattens colours. Added to this is a moire pattern that is made from the screens used to print each colour. This scan comes from an article sent to me by my cousin, Michael MacFarlane (pictured in the photo). The article is promoting the 2009 Scottish Homecoming. The Gathering in 2009 will be the largest clan get-together in Edinburgh since Sir Walter Scott's Pageant of 1822. 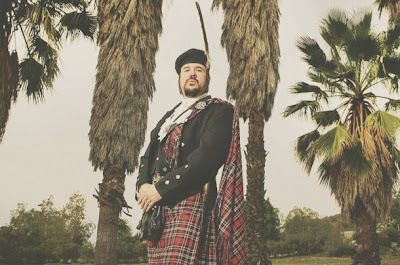 As a retired caber toss champ, I can't wait for this historic event and plan to bring the whole family. In setting up the image in your scanner's software, scan the image in at 150%-200% of what will be required for your final output size (but don't exceed the limit of your scanner's optical resolution). Initially, we see an image that is flat and a bit soft. Our first instinct is to refocus the image. But with newsprint, try a touch of Gaussian Blur first, Filter>Blur>Gaussian Blur. This will tighten up the image and remove most of the moire. From there, we can resume our usual workflow. We will be doing creative sharpening and output sharpening, so don't worry so much about the refocus step. Try just a touch of Gaussian Blur, a radius of 1 or less. Modern printing presses achieve higher line screens than some of the older presses. If you can see a pronounced dot pattern, you may need to use a radius of 1.5 or so. Subtle patterns can be removed with a radius of around .5. For this image, I used a radius of .5. For an more subtle effect try using the Median filter, Filter>Noise>Median, with a radius of between 1-3. 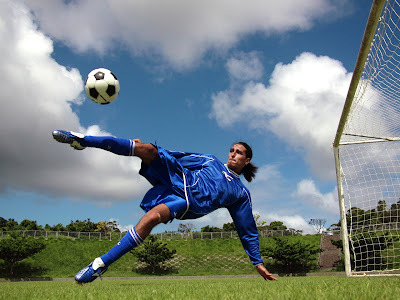 Lynda.com's training library is constantly expanding. At $25/month, it's a tremendous value. Scott Kelby's new on-line training site offers titles like Adobe Photoshop Starting from Scratch, Photoshop CS3 for Beginners, and Camera Raw Workflow Essentials for a low monthly rate of $19.99 (NAPP members get a discount). And finally, O'Reilly's Safari Books Online offers a ton of books from the leading publishing houses for a low monthly rate. Included with your monthly subscription are download tokens which allow you to download chapters of your favourite books as PDF files. December 31, 2007 (IDG News Service) -- New rules will go into effect on Jan. 1 that prohibit air passengers in the U.S. from carrying spare lithium batteries in their checked baggage. The new rules, announced Friday by the U.S. Department of Transportation, are designed to reduce the risk of fires in aircraft. Lithium batteries have been identified as a possible cause of several aircraft fires. In February 2006 a United Parcel Service flight landed at Philidelphia International Airport after the crew detected a fire in its cargo. The National Transportation Safety Board said later that it found several burned-out laptop batteries on the plane, and could not rule them out as a possible cause of the fire. Lithium batteries are a fire hazard because of the heat they can generate when they are damaged or suffer a short circuit, the NTSB said at a hearing about the Philidelphia incident last July. Several big makers of laptops and cell phones, including Dell and Nokia, have recalled batteries recently because of flaws that created a potential fire hazard. Story copyright 2006 International Data Group. All rights reserved. This one goes down as required reading: Jeff Schewe's 10 Years of Photoshop. "Adobe Photoshop 1.0 shipped on a single 800k disk." "One big new feature caught a lot of users by surprise: Color Management. To some it was a Holy Grail. To others, it was a conspiracy to screw up their lives. I think the color management tools in Photoshop 5.0 are great. For the first time, users can do the majority of color management duties right in Photoshop, instead of using an expensive third-party tool."